The Epson SureColor P800 is capable of printing on a wide variety of papers from 4”x6” to 17”x22”, matte, glossy, and any surface in between. 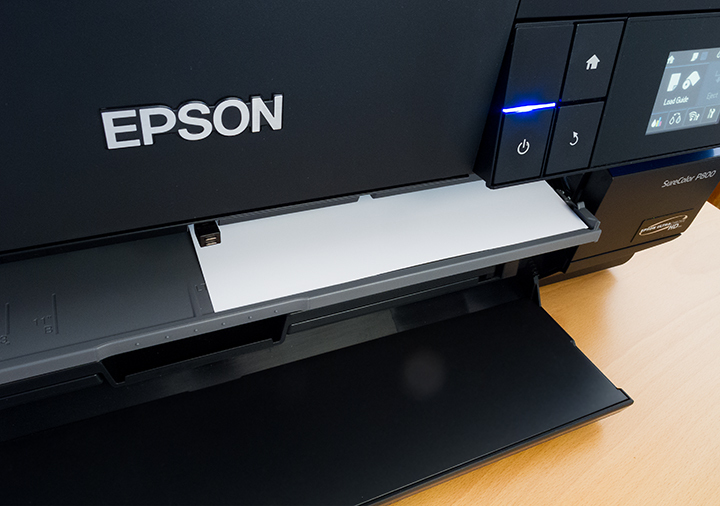 Because all of these papers come in an equally varied range of thickness, Epson has provided multiple feed paths to get your favorite paper into the SureColor P800. Let’s have a look. 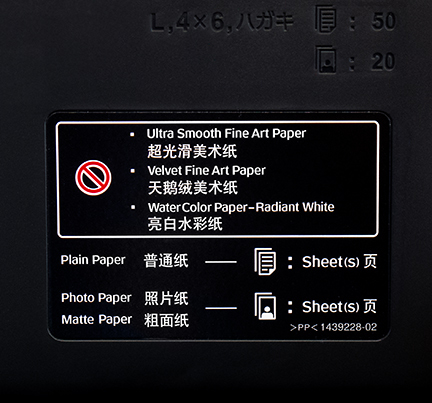 The Auto Sheet Feeder on the top of the printer can accept multiple sheets of anything from plain copy paper to Epson’s resin coated papers, like Ultra Premium Photo Paper Luster as well as a few matt papers like Ultra Premium Presentation Matt, Doubleweight Matt and Singleweight Matt. These papers are flexible enough to make the sharp bend necessary to be fed into the printer and under the print head. The Auto Sheet Feeder allows the full range of cut sheet sizes from 4”x6” to 17”x22”. If you’re a fan of the Signature Worthy papers, Ultra Smooth Fine Art, Velvet Fine Art, and other heavyweight papers, you’ll become very familiar with the Manual Feed Tray in front of the SureColor P800. 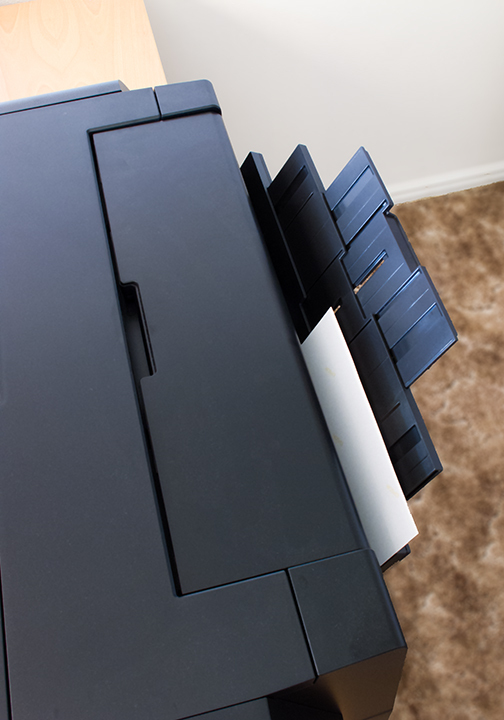 The Manual Feed Tray allows you to load a single sheet of paper into the printer just below the print head, sending it through to the Output Feed Tray in the back of the printer. The guides molded into the tray make aligning the paper easy and accurate. Once the printer loads the paper, the tray is pushed back into its original position, up and out of the way. This paper path requires the paper to bend somewhat but keeps that bend well back of the print head. It also requires some space behind the printer when printing on large sheets. This path is designed to be used with paper from 8 1⁄2” to 17” wide. 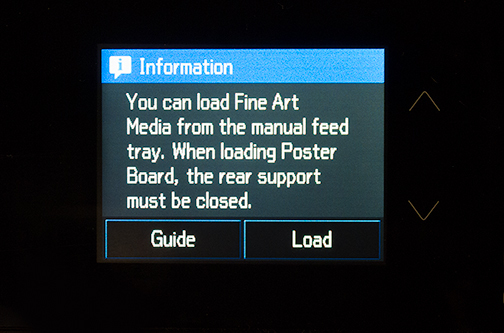 Loading rigid media, like posterboard, is very similar to the process for loading fine art papers except the Output Feed Tray at the rear of the printer remains closed. This allows the media to exit the back of the printer during the loading process and stay there until printing begins. It’s important to make sure there’s ample room behind the printer so the media doesn’t smack up against a wall or some other obstruction, causing a jam. If for some reason you decided not to print on paper loaded using the Manual Feed Tray you can remove it by pressing the eject button on the LCD display. The paper will be ejected undamaged and ready to be used again. 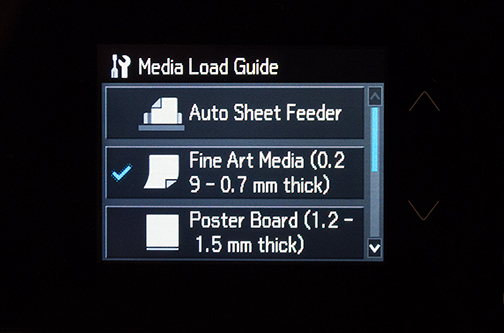 If you get hung up, the LCD panel also displays step-by-step loading guides for each type of media including roll paper. The drivers for the SureColor P800 are smart enough to know which papers are supposed to go through which feed path. When you choose a paper in the PC driver a window pops up suggesting which feed path should be used. Clicking OK sets the suggested feed path for you. Be sure to use that path and only that path. With the Mac Driver you must choose your paper size and path before you choose your paper type. If you fail to do this, the paper options may be very limited. For example if you select “US Letter” as your paper size, the fine art paper choices will be greyed out. Choosing “US Letter (Front Fine Art)” will give you access to all the fine art papers. Like other printers from Epson, the SureColor P800 prints with photo black and matt black ink. Photo black will be installed during the initial setup. Ultimately, the black ink you use depends on your paper choice. Since both black inks share the same set of nozzles in the print head, one black ink must be flushed out before the other can be used. This operation doesn’t take very long but the ink is deposited directly into the maintenance cartridge (waste tank) so it’s gone for good. There are a couple of ways to make the switch. 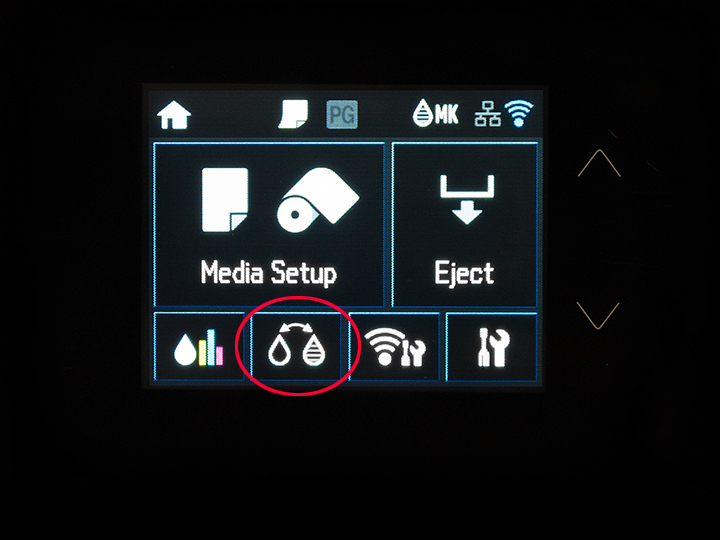 You can make the change by pressing the double teardrop icon on the LCD display. Once you confirm your choice, the printer springs into action. Automatic Ink Switching lets the printer make the change after you have made your paper selection in the printer driver on your computer. Ink switching will take place automatically before printing begins. Once it starts, there is no turning back. Automatic Ink Switching is convenient but it could cause unintended ink switching, wasting time and causing more frequent replacement of ink cartridges and maintenance cartridges. Mercifully, page 138 of the manual, a downloadable pdf file, explains how to disable Automatic Ink Switching using the control panel. In writing this post I’ve made several prints on a variety of media using each feed path. While I was apprehensive about the front feed option for fine art papers I have to say it worked really well even if it added a few extra steps. I did my best to pay attention to the LCD display. When I goofed, loud beeps from the printer let me know. Now that I know the steps, I’m ready for the dance. Next time I’ll attach the Roll Feeder and print some long panoramas. I’ll also be figuring out how to make smaller prints using roll paper. Thank you!!!! I couldn't figure out why the fine art paper options were grayed out for letter sized paper and it was driving me up the wall.